I ran across Smoke Ring, a website devoted to all things barbecue. It looked pretty interesting so I thought I would become a ring member. That is why you are seeing the new set of links at the top of my page. Let me know if you think it is appropriate given the content of my blog or if you think it is too intrusive and is a distraction. The jury is out on this, and you are the jury. I am looking forward to hearing your comments. Actually, the name of this place is Waterfront Ale House. The owner and manager is named Sam. 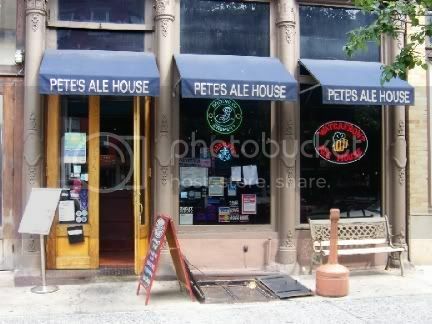 And yet I have always called it Pete's. Maybe it has something to do with their awnings. Ah well, maybe some day Sam will explain the awnings to me. I just popped in to thank him for the nifty new tee-shirts he gave me. I like the orange ones, but the new brown ones are, well, they are brown. I think it goes really well with my 1946 New York Knicks baseball hate (oops, Freudian slip, I meant hat) though. 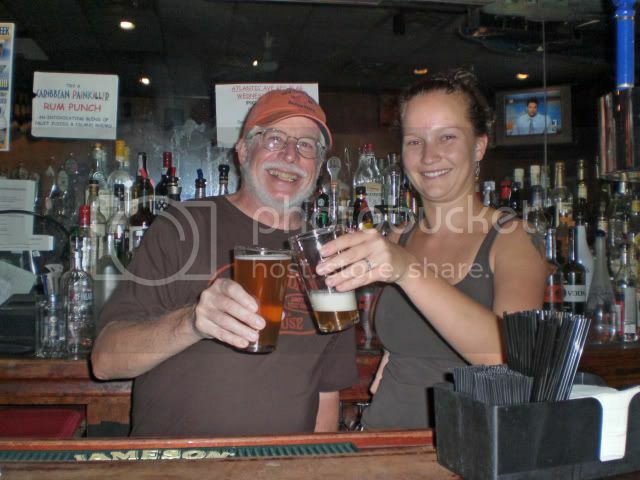 With me is Leigh Ann, the bartender. A very friendly person. In fact she invited me back to her place to have a beer with her. I guess her place really is behind the bar, and mine is usually on the other side. The free popcorn, always fresh, always hot, went well with the beer, but it was lunch time so the Mysterious Chinese Woman and I moved to the tables for a light repast. Actually, it wasn't all that light. I had a hamburger with Cheddar cheese and a thick slice of raw onion. 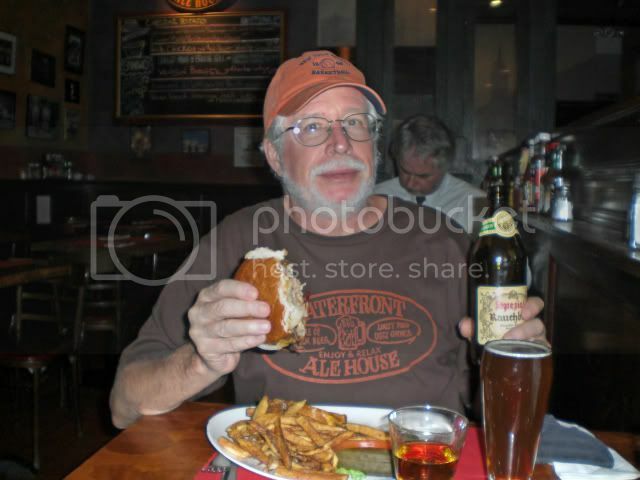 It came with a generous helping of delicious French fries and I had a smoked beer to go with it. Also a shot of Buffalo Trace bourbon. Made for a nice combo. For those of you who may not know, I would guess that would be most of you, there used to be a kid's television program in Minneapolis called "Lunch With Casey." In grade school you went home for lunch and to watch this program, hosted by Casey Jones and his pal Roundhouse Rodney (sounds like he should have been a professional boxer). I don't remember much except there were cartoons and at some point Casey and Roundhouse brought out their lunch boxes and had lunch while explaining what they were having and why it was good for you. Usually, if memory serves me, it was a sandwich of some kind, some fruit, maybe soup, and the inevitable glass of milk that always gave me flatulence. The Mysterious Chinese Woman opted for a half order of ribs with extra coleslaw instead of more French fries. I really like the coleslaw here, made with a touch of wasabi to clear your nose. 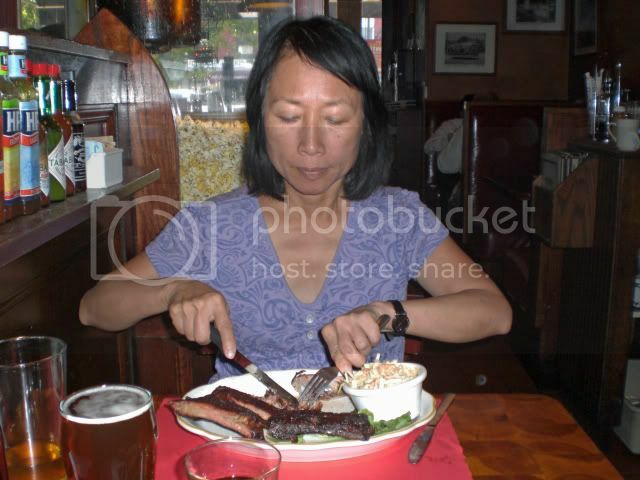 Of course The Mysterious Chinese Woman had to embarrass me by demurely eating her ribs with a knife and fork. The ribs were delicious, as always. Even though she only got a half-order there were plenty and I managed to have four of them later in the evening in lieu of dinner. This might not be the first place you think of when you think of going out for barbecue, but it probably should be. I have a lot of pictures and stuff to post about my day and night at Coney Island for the Rockabilly Festival and the Burlesque/Sideshow. I will try to get to them tomorrow, but here is a preview. As you can imagine, we had a great time. Let me tell you, this is one dynamite Caribbean restaurant. I have now eaten there three times in the last several weeks. When you realize that this place is out in Coney Island, not really very convenient to where I live, that is saying something. 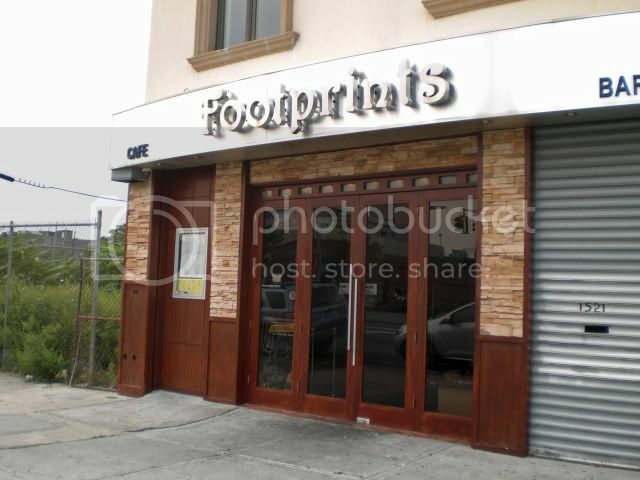 It is located at 1521 Surf Avenue about two blocks back from the boardwalk and the beach. One time I stopped here after a Brooklyn Cyclone game, the other day it was between an outdoor Rockabilly Festival and a Burlesque/Sideshow taking place in Cha Cha's (more on that another time) and then Monday with my brother-in-law Jim after dropping the Mysterious Chinese Woman and the Mysterious Mother-In-Law off at the Aquarium. They have a very nice bar and the bartenders are flashy in that Tom Cruise kind of way when they want to be and build a pretty decent cocktail. I don't think they juggle the bottles though. The picture above was from Saturday and I got my Makers Mark Manhattan just like it was supposed to be. For some reason on Monday I initially got my Makers Mark just straight in a brandy snifter. This is what happened the first time I came in here as well. For some reason when I order my drink straight-up they must think I mean just straight Makers Mark. Oh well, no real harm done, I explained what I wanted and Alfredo, the bartender, made things right. 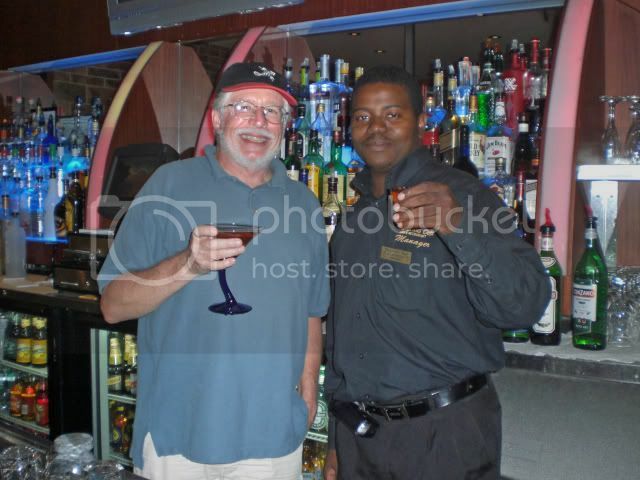 For some reason Alfredo thought he should be holding a drink too so he poured himself a shot of Makers Mark. 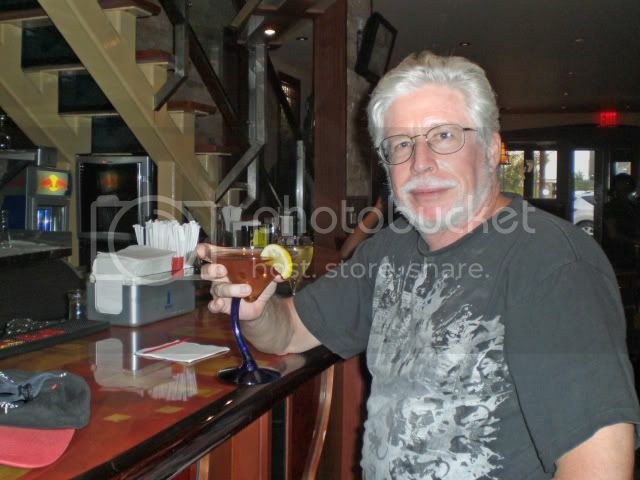 He said he doesn't drink though so after posing he just added it to my Manhattan. Hey, you won't hear me complain. The first time I came here I shared the Cod Cakes with the Mysterious Chinese woman and they were delicious. On Saturday we ordered the Escovietch Fish Fingers as an appetizer but by the time we were finished we were too full to order anything else. 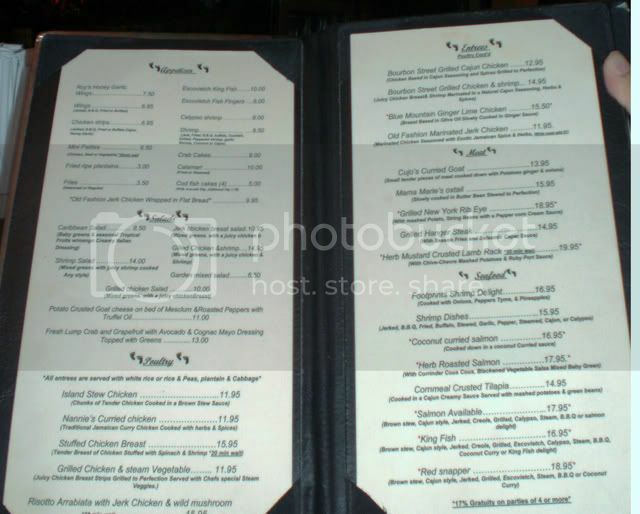 On Monday Jim and I shared an order of the Fish Fingers and an order of Calypso Shrimp, also an appetizer. These are just fantastic. 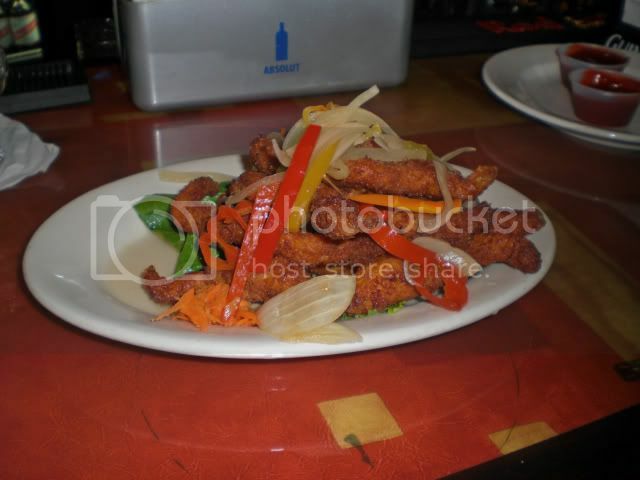 The fish is really tender and nice and crispy on the outside. It is served with a dynamite condiment made mostly of onions, carrots, and habanaro peppers in vinegar. You might want to be careful because it is hot. When I was in Belize many years ago just about every restaurant had a bowl of this sitting on the tables. And the first time I tried it I didn't realize how hot it was. I quickly learned though. I haven't seen it in any restaurant since so this was a real treat. Escovietch refers to the spicy condiment and they also have an Escovietch King Fish on the menu that I will have to try one day. 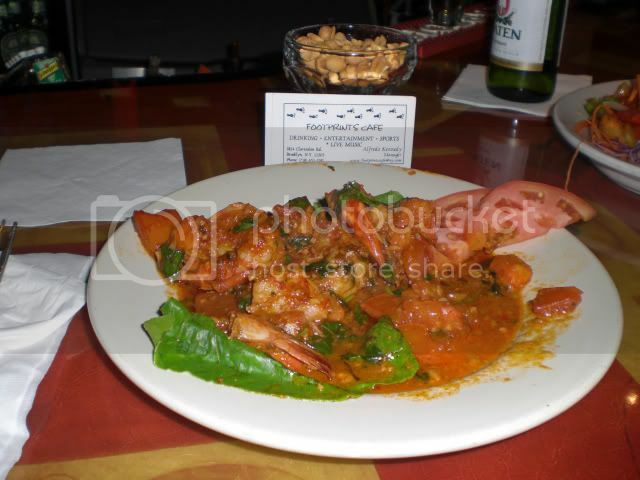 The Calypso Shrimp was also nice and spicy, but not too hot. Just a really good taste. The kind of taste I shoot for when I attempt to make dishes like this. Once again, though, after splitting two appetizers between us neither of us were really hungry enough to order a main course. And that is really a shame because they have so many interesting things on the menu. I like spicy ox tail stew a lot and I bet Mama Marie's Oxtails stewed in Butter Beans would be terrific. There Old Fashioned Marinated Jerk Chicken sounds wonderful as well. Hell, I want it all. Next time I am going to bring a hardy appetite. Alfredo showed me the kitchen and proudly proclaimed that everything was made with only fresh ingredients. From what I have tasted so far I have no reason to doubt him. 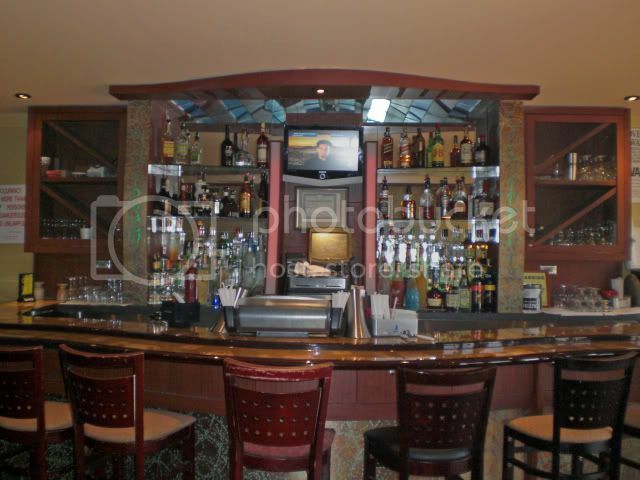 Upstairs is another smaller dining area with a separate bar and a bit of a lounge. It was not very crowded on Monday, but we were there at a kind of dead hour, about 4:00 P.M. or so. When I stopped here after the Cyclone's game it was probably a bit after 11:00 P.M. and the place was packed. 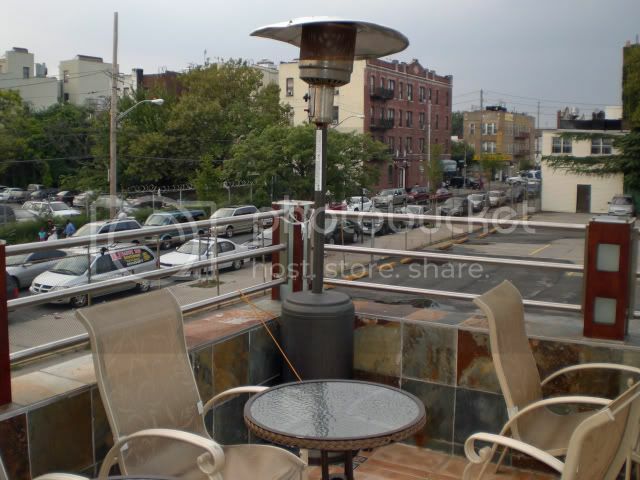 There is also a small outdoor seating area but the view isn't particularly scenic. Still, it would probably be nice on a cool summer or fall evening. 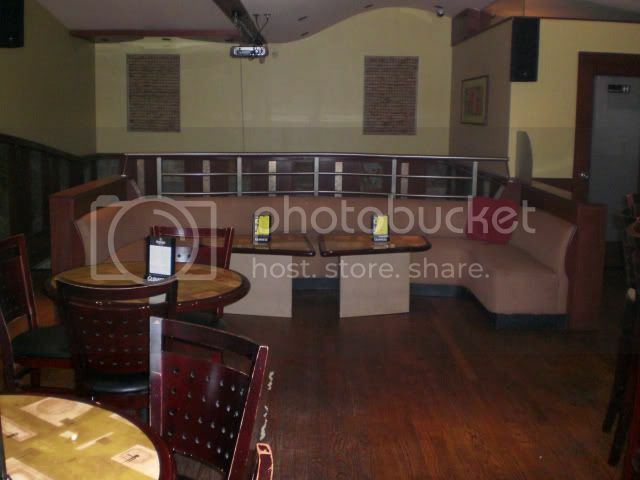 In the downstairs area is a small stage, really more of a platform, tucked into a corner and a sign advertising Latin Night on Thursdays where you can get two Coronas for the price of one. Alfredo said they had music a few nights a week, mostly reggae. Even though this place is long subway ride away from where I live, I will definitely by taking that train in the not-too-distant future. It is only about a block from the Coney Island subway stop though, so it isn't too bad. Coney Island can be a bit desolate at night once the rides and everything close down. Even Ruby's Bar And Grill closes up for the winter sometime in November. And, with all the talk about developing the area you never know from one year to another just what will be here and for how long. I hope Footprints will remain unaffected. Just an addendum. I downloaded Google's new browser, Chrome this morning. 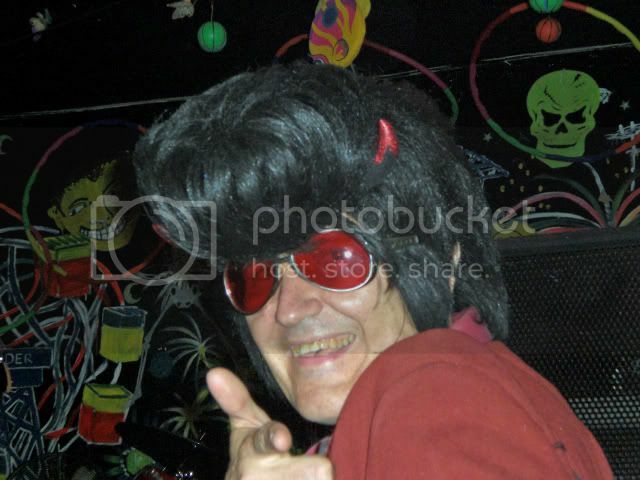 For some reason while using it I wasn't able to upload my pictures to Photobucket. I switched back to Firefox and didn't have any problem I will have to check this out again, it seems like that would be a real drawback if indeed is is due to some incompatibility issue. And, when you try to use Hotmail with Chrome you get a message suggesting you upgrade your browser to either Explorer, Firefox, or Apple Safari. Hotmail does seem to work okay though. Also, I wasn't able to use the compose feature of Blogger with Chrome. I couldn't click on the pictures and re-size them. Again, I had to switch back to Firefox to do this. 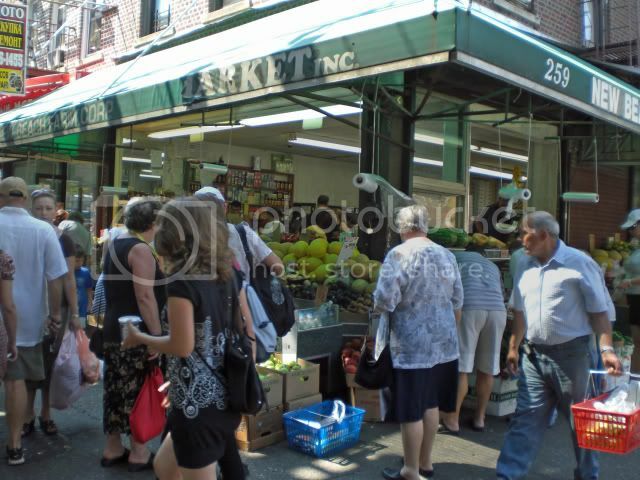 One of the fun things to do in Brighton Beach is to go shopping. I always like to visit grocery stores, even when I travel abroad. 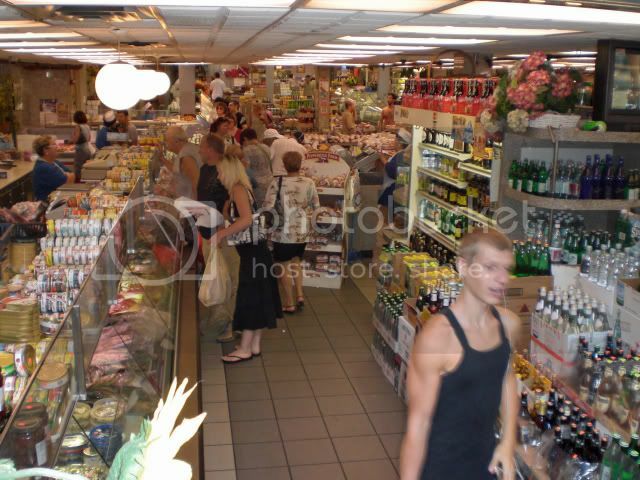 Puerto Vallarta's grocery stores are getting a bit generic because all of the tourists, but there is are a couple of older ones that are still pretty neat. Of course they can be a bit infuriating too because you never know when they will be out of stuff. And sometimes you need to ask someone for help because the labels are in Spanish. But that is what makes it an adventure. The stores in Brighton Beach are a bit like that as well, only the language is Russian, not Spanish. 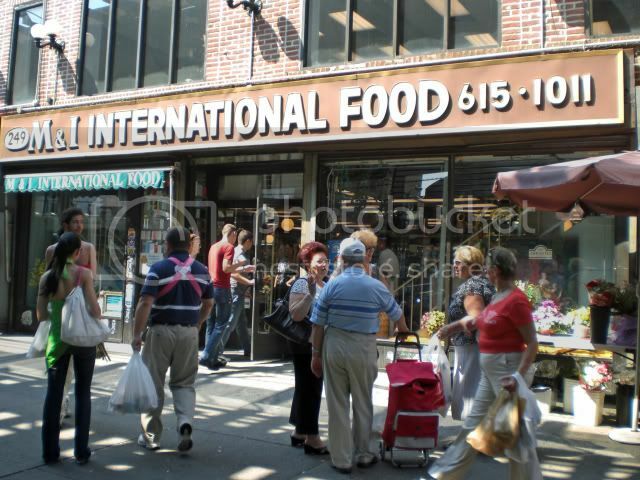 My favorite store is M & I International Food, right on the main drag and across the street from the elevated train. 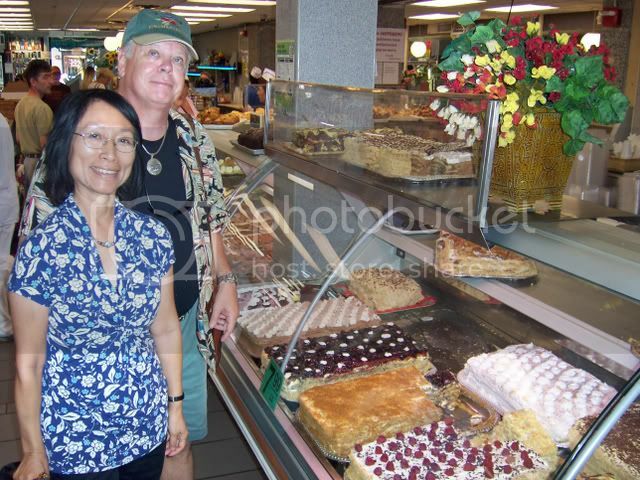 It is fun just to walk around and see all of the food. 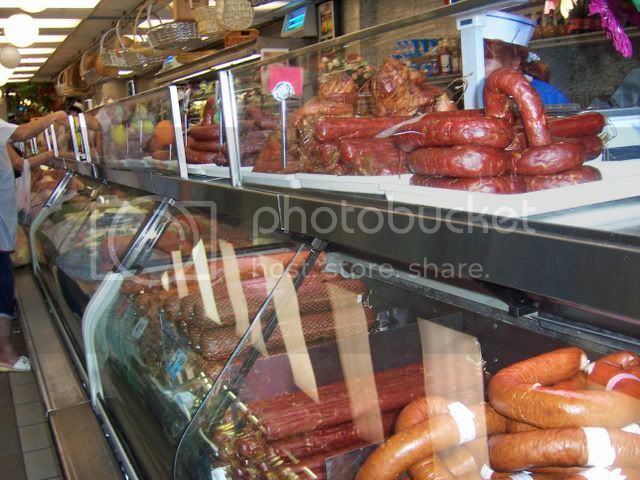 More sausages and fish, especially smoked fish, and meat, and..., well you name it and they have it. This place is always packed and it helps to be a bit aggressive if you want to get the attention of the person behind the counter. It also helps if you speak Russian. I like the sausages, and they have a couple of dozen types. 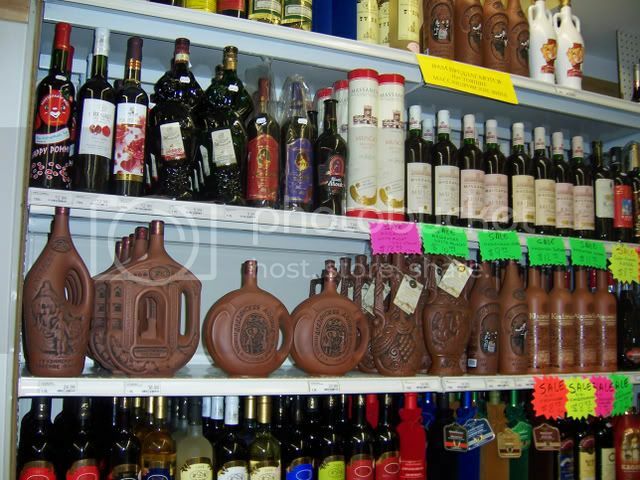 They also have a large selection of Russian and other imported beers. For those of you who don't know, in New York liquor stores can only sell liquor. Even mixes that are sold in liquor stores have to contain a small amount of alchohol. Usually just 1% to satisfy the technicality of the law. 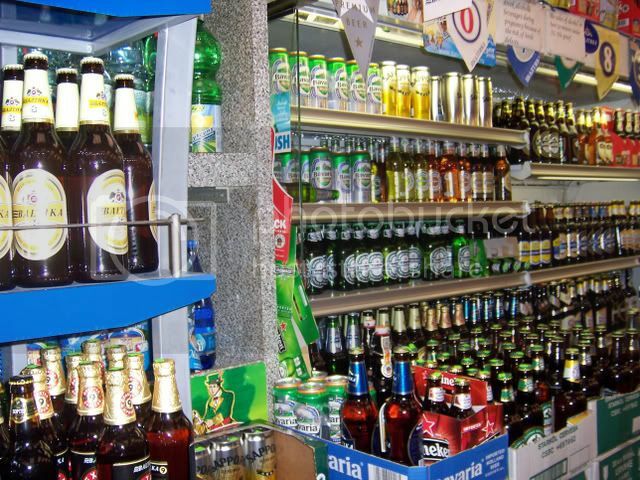 Beer is sold in grocery stores and delis or bodegas. 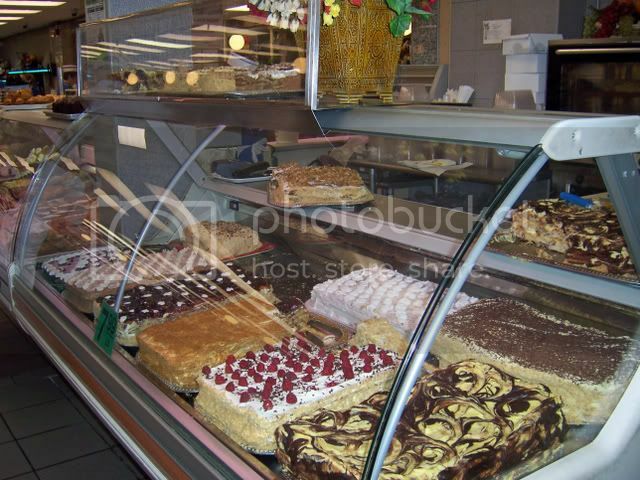 They also have a large baked goods and pastry section. You can guess who found there way to this display. There is seating both downstairs and upstairs so you can get a pastry and a cup of coffee or tea and enjoy a little snack. The upstairs area is more like a cafeteria with a nice selection of prepared foods to choose from. There is also outdoor seating up there. It was quite crowded so this must be a real favorite of the locals. But then this whole area is quite crowded. 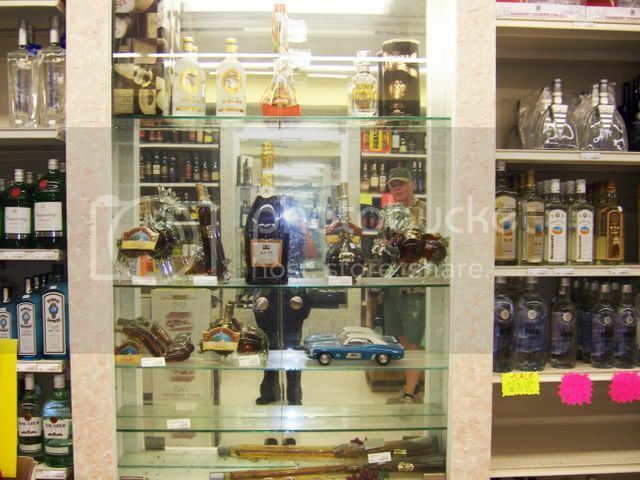 Right next door is a liquor store that also offers a lot of interesting liquors. More types of vodka than you can find most places. No surprise there. Also some interesting liquors. A lot of rowan berry liquors so I guess this must be a Russian specialty. Next time I head there I think I will pick up a bottle just to try it. There are a lot of little, and not so little fresh fruit and vegetable stores in this neighborhood and they always have really nice looking produce. 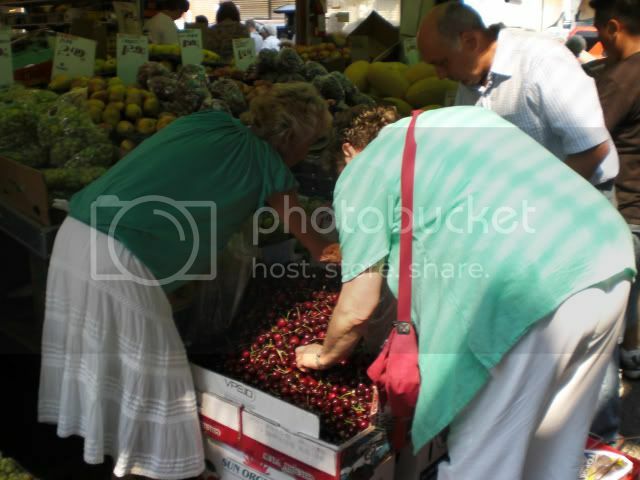 Cherries must have been in season because they had big crates of them and you had to kind of push your way up to the in order to fill your bag. So there you go. A real fun way to spend the afternoon. Head out to Brighton Beach, grab a bite to eat on the boardwalk, do a little shopping, and then head home or head to Coney Island and hit one of the great little dive bars while they are still around. Cha Cha's and Ruby's top my list. Or hit the Beer Beach and grab a beer, they have a really large selection. As you are probably more than aware of by now, I have been highly critical of the over-hyped "waterfalls" art installation, a 16 million dollar eye-sore in my opinion. The hours of operation will be cut in half beginning September 8th. Finally, after Parks Department officials have acknowledged that trees along the Brooklyn waterfront and Governors Island were being damaged by the saltwater spray. Nothing like spending all of that money on something that is not only ugly, but destructive. And money that could be better spent supporting many of the talented and local artists in this city that struggle to survive. Don't get me wrong, I love New York. But it will drive you to drink (one good thing about it). We can spend millions of dollars to put up an artistic mosaic in one subway station, but can't find the money to paint another where the old paint is literally falling from the ceiling. Okay, I am done for now, I promise. Only nice things for awhile. Really. Okay, my last rant, for now. My next post will be about shopping in Brighton Beach, I promise. I am going back to visit friends in Minneapolis so I booked my tickets on Sun Country Airlines. If they fly where you are going the fares are reasonable and I have, until now, found the service to be good as well. So what the hell happened. My options for returning to New York were, at the time I purchased my tickets, a flight that departed at 6:30 A.M. or 4:20 P.M. I opted for the later departure time and paid and extra $86 a ticket to do so. Figured on getting to the airport early, checking in, taking the neat little train to downtown Minneapolis, having a nice lunch, take the train back and catch the plane. This is what I usually do. Okay, Sun Country has apparently canceled the afternoon flight so I got a message on my answering machine saying that I had been moved to the earlier flight. I called Sun Country and asked if I would then be credited with the $86 a ticket difference in the price. They said "No," this was not their policy and it couldn't be done. Run this by me again? If this isn't a case of bait and switch what is? You pay extra for a more convenient departure time, they move you to a cheaper flight, and won't reimburse you for the difference in air fare because it isn't their policy to do so. Give me a break. If you were buying a piece of merchandise and paid for, say, a more expensive refrigerator and were then told it wasn't available but you would get a cheaper model and, by the way, have to pay the same price as the more expensive model, it would be illegal. So here is what I had to do. Call Sun Country and cancel my reservations, which they allow you to do at no charge if it is because they canceled the flight you booked. How nice of them. Then I called again and made reservations for the flight they were going to change me to and I was able to get the lower fare. So, because even though it wasn't their policy to credit me with the difference in the fare, I was able to get it anyway in a round-about way. Let me ask you, does this make any sense from a customer service perspective? Could it possibly be less expensive for Sun Country to have to do it this way? Are there people who didn't do what I did and will end up paying more for a cheaper flight they didn't want? And then the airlines wonder why they are so poorly regarded by their customers. Oh, and here is another one. You once were able to reserve your seats online for free. This allowed you to simply print out your boarding pass in advance and check your bags without having to stand in line or take up the time of an airline employee. A win win situation. Now they charge you $6 per person per leg to do this. In other words, they are charging you to use a service that would save them money if you used it. And they wonder why they are losing money. My favorite, though, is charging extra for a window or an aisle seat. If nobody paid would they fly the plane with only middle seats occupied? Do some people get aisle or window seats for free because there aren't enough middle seats to go around? Do you think these people talk to each other and realize how some of them have been ripped off? I, personally, think that the people who are asked to sit in an emergency exit row should charge the airline for doing so. And make them sign some kind of a damage waiver. You just know someone will sue if you didn't open that door fast enough. What the hell are these people thinking.